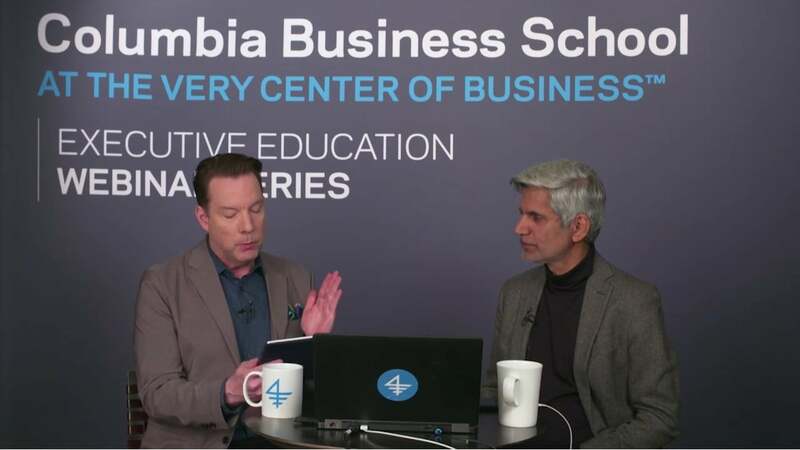 Listen as Columbia Business School Professor Hitendra Wadhwa answers more questions from his recent webinar on The Anatomy of a Great Leader. All right. One of the questions I really love that came in was from smiter. How can we cultivate a culture of mindfulness in an organization where being heard is more important than being quiet. Beautiful Question. I think more and more organizations in general are starting to get very respectful if not very actively invested in this. You know these kinds of interior practices and creating the spaces for it you know for example etc. I would say that if you are seeking to be an agent of change in a organization that hasn't yet fully embraced this right down then think about certain small steps that you are in a position to help make happen there. For example starting a certain gonna like Friday a program encouraging if it is possible the facilities and the H.R. people to help set up a room you know where people can go for quiet reflection hoping to just do some small experiment within your own team so be that you know that kind of like be that tone that is stone that stone that is thrown in the water that starts right and the initial kind of flurry of just putting the story in is very inconsequential. But the ripple can actually be very multiplicative over time. So if within your sphere of influence you can dig one or two practices and thank me for example in our present leadership. One of the things that we do is start every meeting with mindfulness moments and sometimes it's just a moment of quiet to reconnect with our core and eliminate the debris of what's happening on the outside of life. So they've been not distracted we can bring up Bethel's for the purposeful mission or whatever it is that the meeting is about and sometimes that moment of Mindfulness is about us actually having one of us speak us through to get us to a place of inspired commitment to whatever it is that we are collectively engaging in that meeting to talk about the significance of that to talk about the you know the beauty and of the possibilities ahead and what we are here to do. So you know that's an example of a small little practice you know and you know all of us. It's not just in our own little domains. Great. I'm going to combine two questions because they're kind of on the same theme. So one of them is two good leaders have specific genetic traits or can all leadership habits be acquired and then if not if they don't have it when they step into that position how do we coach and help those leaders where do we start to bring that level of understanding. Yeah. The genetic view has been with us I think for a while. This notion that you know as a born you know and some people are just naturally so much x y z today and that is starting to gets challenged happily. So I think in terms of the possibilities it creates for all of us through a lot of really powerful signs you know coming from for example psychology the with a growth mindset from neuroscience from the signs from neural plasticity the plastic nature of the brain and also genetics where there is a field of epigenetics involved just showing that actually what we really are you know influence and shape is not as much the absence of presence of genes within us but the activation of those genes which means that active innovations are not active and the activation of genes is something that we can control through our lifestyle through a certain kind of like thought mastery practices through certain behaviors. So to that and I would say that there is a lot of evidence that while each of us is definitely born with a certain sort of unique starting point and proclivities and etc. that there is a world of opportunity available to each and every one of us to intentionally shape our path forward and leadership. Now what does that mean for how we cautioned hobby guide leaders. You know I'm a proponent of very rich topic the the core. You know I think work leads to a insight that coaching and development has to come from the inside out that we can't just impose it on people by giving them sudden you know simplistic behavioral formulas you know the way to give feedback is for example start with something positive then give them the critical piece of feedback along with examples of what they can do differently and then end with something positive that's too formulaic you know and the the core idea is that hey listen you have to get to a place of just deep committed purpose deep caring for this individual. You have to get them to a place where they're really inspired by their purpose. They feel a great sense of caring for the common good. And then you can have a free flowing conversation about it and so so you know in this little Pithie kind of you know compact like you know a conversation moment that you have today. The one thing I would offer to you is that when you think about developing anybody whether it is your child rather it is your subordinate whether it's a line that you're trying to help or a large team think about how to work with them. Getting to have them connect to the Anacor Yeah. So Shondra just asks is so real leadership is the right balance. That's the operative word. I think the right balance between inner core and exterior presentation the leader demonstrates his or her value vision to others. So it's knowing that.